Ilana elbowed me and eyed the couple sitting to our left in the Hirsch Theater. Shaken out of the reverie brought on by the Tarshiha Orchestra’s rendition of Um Kulthum’s hit song “Raq al-Habib,” “The Servitude of Love,” I followed her gaze. The woman to my left was tapping out a text message on her Android as she whispered to her husband, who had a large knitted blue-and-white kipah on his head. “Hadas,” she said, apparently in response to his question. “Did you tell her?” he asked. “Doing it right now,” she nodded. The young woman who was standing in for the late great Egyptian chanteuse finished the song with a flourish and the audience cheered. Nasim Dawkar, the concert master and conductor, called another member of the chorus up to the solo microphone to sing another song composed by Muhammad al-Qasabgi, to whose works the night’s concert was dedicated. The woman at the mike, plump and heavily made up, launched into an Um Kulthum favorite, “Inta ‘Omri,” “You are My Life.” Ilana smiled and mouthed the words silently—it’s a song her mother used to sing to her and which Ilana sang to our own children. 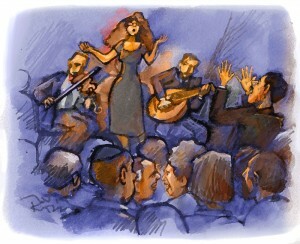 Over the years I’ve come to appreciate Arab music. Now I know why it sounded like annoying noise at first—it’s based on an entirely different scale than music in the West, one with notes between the notes we know, a music of unisons rather than harmonies, where structure and meaning are provided by repeating rhythmic and melodic motives rather than harmonic progressions. The Tarshiha Orchestra, like others of its kind, is composed mostly of stringed instruments—eight violins, a cello and double bass, an oud, a zither, and percussion, with a single nay flute as the only wind. “Believe what?” said the husband in an undertone that was barely under. “Oh, so did we!” said the husband, leaning over his wife. “She’s really great, isn’t she?” And he joined clapping the rhythm with much of the rest of the audience. Um Kulthum of Tarshiha launched into an extended gruppetto that rose and fell and rose and fell again like a tsunami of adoration of the light of her life. The audience went wild. A man two rows in front of us jumped to his feet, hooting and applauding. I felt a hand on my wrist. It was the woman next to me. She gave me a quick glance out of the corner of her eye as if commanding me to follow her gaze to the applauding man. “Tell her you don’t care what anyone did to her daughter-in-law,” Ilana whispered angrily in my right ear. But my neighbor was gripping my wrist and my not-so-subtle efforts to wriggle free made no impression on her. “My daughter-in-law works at VAT,” the woman stage-whispered at me. “We’re Iraqis,” the woman reassured me. “Well, northern Iraq,” the woman said defensively. “But Iraq,” her husband insisted. “She works on the tenth floor,” the man interjected. “It’s a big elevator,” the man said. He now placed a set of calloused fingers on top of his wife’s hand, which had, in the meantime, worked its way up to my forearm. “See, our son, Ya’akov, is in Hong Kong on business,” the man explained. “No she doesn’t,” his wife snapped. The woman turned back to me and tightened her grip. “You didn’t know right away, you asked me when I got home,” her husband said. “Ze’ev’s a great guy, always ready to help,” the husband assured me. “So they get on the elevator,” the husband said. I look at the man two rows before us, who was holding his arms up high as if he wanted to grab the singer on the stage. “Do you think he gets up close?” the man asked me. “He retreats into the farthest corner he can find,” the woman chortled. “So you know what happens?” the woman asked. “There’s an earthquake!” the man said. As the sound of the orchestra faded, a few seconds of utter silence filled the room, as if the audience were too moved to react. Then the applause broke out. Gradually, by twos and threes and then by whole rows, people rose, joining the already standing man two rows in front of us. The woman finally loosened her grip on me as she and her husband, and Ilana and I, stood to acknowledge the moving rendition. Ilana leaned over to speak to her. “And there he is?” she said, directing her gaze at the man two rows in front. Her husband was looking at him warily, uncertainly, in trepidation. No one like you, Haim. Thanks for your marvelous stories, this one among your very best!